The 2011 Olympic Silver Uncirculated Coin will be the third 2011-dated strike of the series to be issued by the United States Mint. 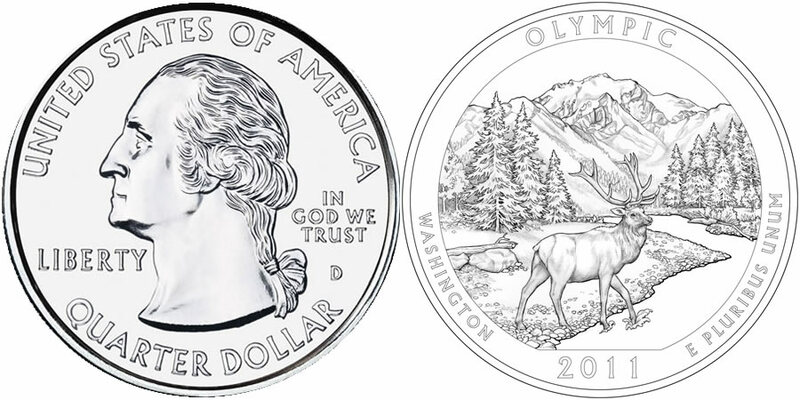 It honors Olympic National Park of Washington and also marks the eighth release of the America the Beautiful Five Ounce Silver Uncirculated Coin series. Coins in this series are considered the numismatic versions of the America the Beautiful Bullion Coins, and just like that other program are struck from five ounces of .999 fine silver to a diameter of three inches. They feature reverse designs emblematic of selected sites of national interest from around the United States and its territories. These programs offer similar designs to those found on the circulating America the Beautiful Quarters® Program and are issued in the same order as those smaller strikes. Olympic National Park is found on the Olympic Peninsula of the state of Washington. That location on a peninsula with a mountain range separating it from the mainland helped to preserve the flora and fauna of the region resulting in many endemic species. The park was established on June 29, 1938 after first being designated Mount Olympus National Monument. John Flanagan designed the portrait of George Washington that is featured on the obverse of all of the America the Beautiful Coins. It is surrounded by the inscriptions of UNITED STATES OF AMERICA, LIBERTY, IN GOD WE TRUST and QUARTER DOLLAR. A Roosevelt Elk is shown standing on a gravel bar of the Hoh River with Mount Olympus depicted in the distance on the reverse of the coins. Around the image are the inscriptions of OLYMPIC, WASHINGTON, 2011 and E PLURIBUS UNUM. The reverse was designed by AIP Master Designer Susan Gamble and sculpted by United States Mint Sculptor-Engraver Michael Gaudioso. "999 FINE SILVER 5.0 OUNCE" is inscribed on the edge of each coin indicating its weight and fineness.